Made a quick video on the course regarding winter play and our teeing grounds and 2 hole locations. We remove the tee markers for winter play to refurbish the markers and help spread the wear and tear to our tees. We ask that you tee it up on the edges, front or back of the tee and limit use of the middle. The tuf is not growing and middle of the tees has heavy usage during the season. This will insure that our tees have equal wear and will come out ofwibter ingoid condition. We also will place 2 holes in every green to help spread out wear in case the greens freeze and we cannot change the holes. I would expect that we will change to 2 holes later this week since staff will be taking time off during the holiday season. We will place a sign at the first tee notifying you when 2 holes are being used. We ask groups to rotate the flag to the 2nd hole once your group has completed the hole. The holes are usually placed on the left and right side or front and back depending upon the green. This past season was a most difficult one for the trees on our property. Oak gall wasp, roller coaster of temperatures and moisture over the last 10 years with record all-time high temperatures and rainfall. Also, one thing to keep in mind a number of our trees were planted in the 40's to 60's which make them range in ages from 60 - 80 years. We have about 20-25 trees of all sizes to remove this winter. 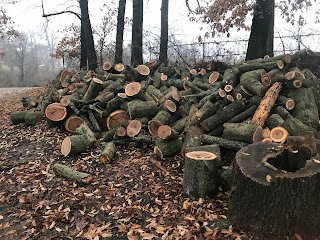 From green ash, locust and a large number of Pin Oak plus a couple of other red oak species who haven been under tremendous decline over the last few years. In most cases, these trees are in areas or groups of trees and are not strategic such as protecting doglegs. We do have an area along the left of #1 where we lost a couple of trees that need replacement and we hope to get a couple moved in this area over the next week or two. There are a number of other large trees that have showed some distress this season and will probably die over the next few years. Just like grass plants come and go, so do our trees. We attempt to remove trees without a contractor unless they are too tall. Once we determine that we need the contractor, we call them in for a day and they remove tops on some of the largest removals that we need assistance in dropping. This might only occur once or twice a year. Our staff saves a tremendous amount of resources doing a majority of this work. 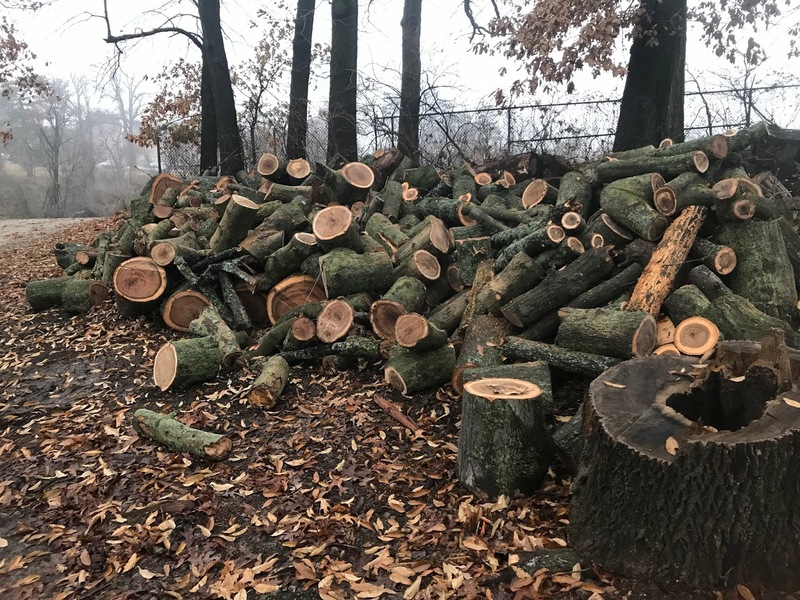 We like to prune limbs off of trees because of the close proximity of other trees that we do not want to damage as well as the protection of valuable turf areas. I also like to take the weight off of the tree so we can direct into exactly where we want it to fall. Trees can twist and turn without warning. We are also not aware how strong or condition of the trunk in case it possibly would snap as the weight begins to move one direction or the other. We rented a lift for a week in an effort to drop as many limbs as possible. 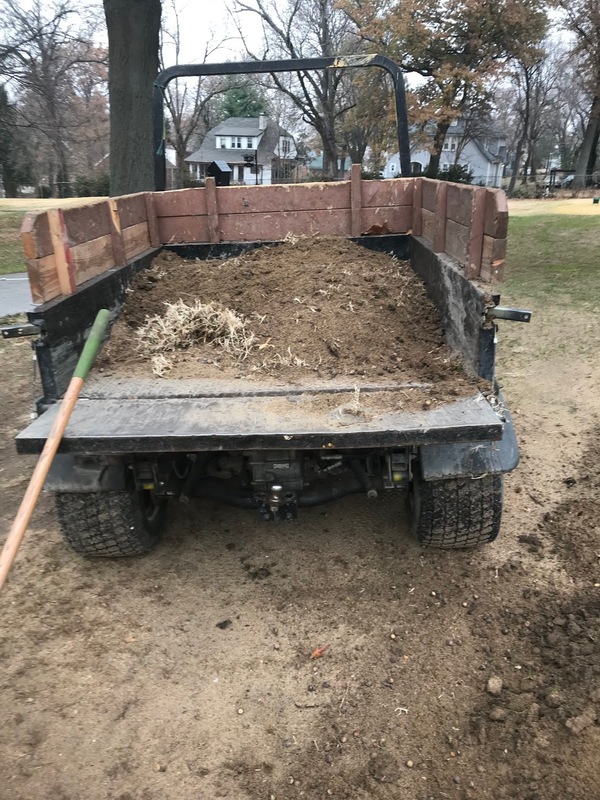 We chip the limbs in our dump truck and save the mulch for the range walk paths and other areas on the course where they can used. We are trying to do as many as we can over a weeks time to manage our resources. We haul off the larger limbs to areas around the maintenance building where we split the good Oak for firewood. We burn significant amounts of wood in our wood burner to heat our maintenance building. We save a minimum of $ 2,500 in natural gas expense over the winter. We will then remove the large trunks after the holiday break which will take a few weeks. We have a small crew and it takes a significant amount of effort to remove the brush, limbs and log the trunks. . In discussions with the green committee this fall, I talked about developing a plan to replace strategic trees as necessary but to not get into a large scale tree replacement program. We have a difficult time with managing our resources when it comes to the trees on our property. The shear size of these trees on an overall small piece of property is very difficult at best to manage. It is important that we conserve resources such as water, fertilizer and the total cost in tree management. Blowing, raking, mulching and grinding and mulching and grinding some more. 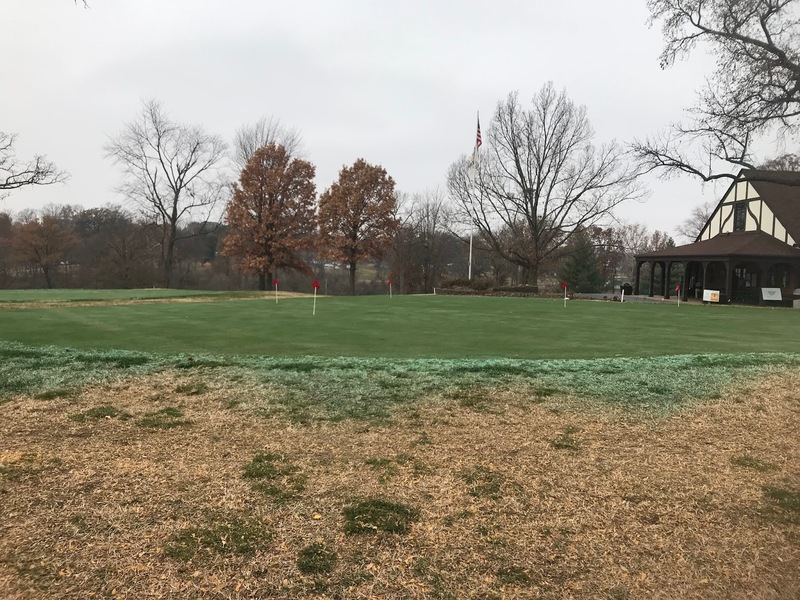 Our most important asset that we have at Glen Echo is the turf grass that provides the playing surfaces for our great game. Below is video of Gamma Tree removing the Sweet Gum next to the Pro Shop and practice green. I'm in awe of the work these guys perform. You learn to have a great appreciation for their work when you go up 40-50' doing the lower level work that we do. The removal of this tree will help to keep the practice green/cart parking area and ornamental plantings free of gum balls, leaf litter and other debris. 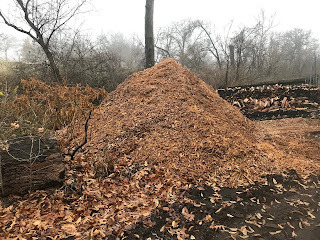 There are trees near 8 green partially removed (locust), Pin Oak right rough 16 230 yards from the green partially removed and another which has a large part of the crown of the tree exposed about 185 yards from the green that we have not trimmed yet but must be removed. Contractor from Gamma working on the pro shop tree. 4 left side of the path about 50 yards before the cross path to the field bar at 7. Tree died over the summer. 11 top of the hill right side of the cart path at start of fairway. Had significant decay. Today's look at the pro shop after removal of the sweet gum. #18 right side of the fairway about 230 from the green. Oak died over the summer. This tree was about 30 yards behind the tree above in the middle of 17/18 rough. This oak is to the left of the cart path on 2 near the green irrigation box 225 yards to 2 green. Died over the summer. There is another oak in significant decline up near the left tee on 16 which is in the same row of trees. I pruned it the best I could to make it look a little better for this season. Oak chips used for walk paths and other needs on the course and of course the logs from the limbs only. We still have to cut the main trunks down. Our bunkers have gone through their 6th season and are in need of some repair. Most of the entrances and exits have some wear and tear issues from both equipment and efforts to keep them clear of debris. We spent most of the day on Friday reparing the left front bunker of #5. The first thing we had to do was remove the sod along the edge to locate the actual edges of the bunker. We had to remove the excess sand that has been either blown out or drug out by our bunker rake. We took the sod off and scraped the sand down to the soil layer and dug down along the sand until we found the original bunker edge that was done in 2012. 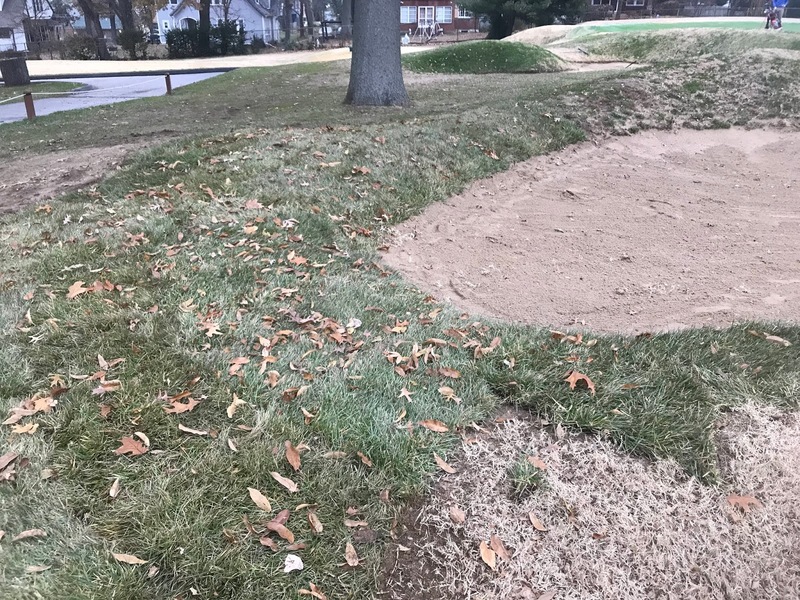 Once this was completed, we then laid new fescue sod and then moved the sand up against the new sod to assist in stabilizing the bunker edge over the next few months. In some cases, we will need to remove sod from the green splash side of a bunker as well. 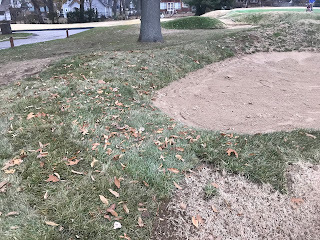 We will attempt to complete a bunker a week until sod cannot be cut from our supplier and will then begin again in late winter/spring hopefully completing most of the problem areas before spring has fully arrived. 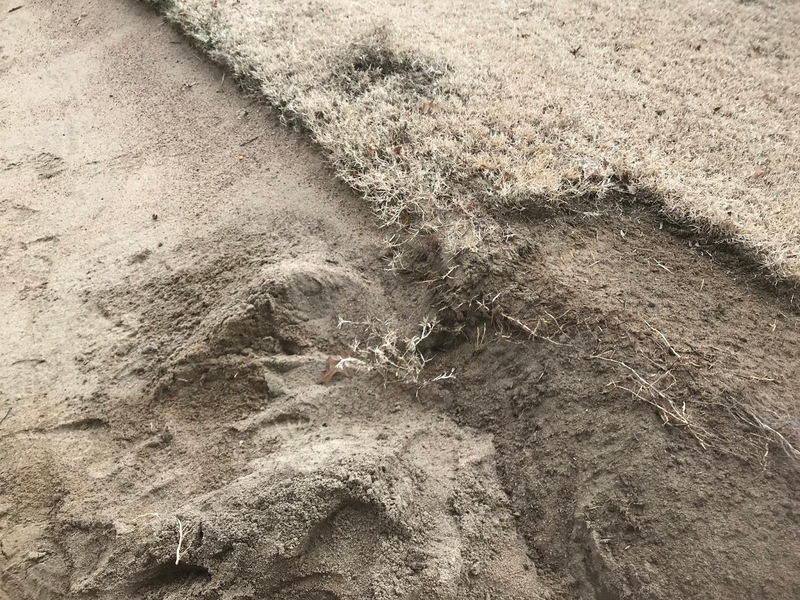 We will of course be checking sand depths and adding sand as needed as well to insure we have proper depths for our members and guests to play. 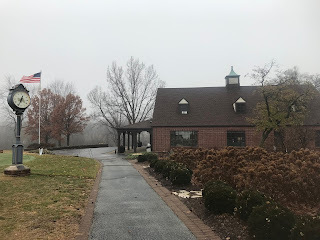 which has some late season benefits as well as early season benefits for 2019. Click on the link if you want to read more about it. Arrows designate the edge of the bunker. We stripped off the sod from the tip up the arrow back up the slope. 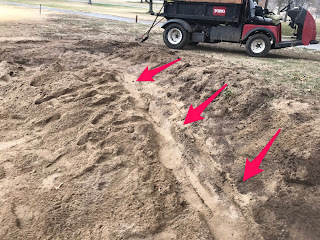 Sand hand been pushed up over the actual bunker edge so we dug down into the sand bank to find the original edge of the bunker Kyle Goalby had originally shaped. Repaired edge with new sod. Sprayed the greens late last week with a fungicide which delays fall/winter dormancy and should assist in spring green up. Yes think spring! The ugly weather stats for November. The course was closed 9 days in November with 6 other opened days where the avg high temperature was 39 degrees so far all practical purposed closed 15 of 26 available days that we could have been open. TIED 6TH COLDEST NOVEMBER ON RECORD (38.8 DEGREES). TIED 4TH MOST OCCURRENCES WITH A MAXIMUM TEMPERATURE LESS THAN 60 DEGREES (27 DAYS). TIED 3RD MOST OCCURRENCES WITH A MAXIMUM TEMPERATURE LESS THAN 40 DEGREES (10 DAYS). TIED 8TH SNOWIEST NOVEMBER ON RECORD (5.2 INCHES). TIED MOST OCCURRENCES WITH AT LEAST ONE INCH OF SNOWFALL (3 DAYS). 1 LOW TEMPERATURE RECORD TIED (18 DEGREES ON 11/10, ALSO SET IN 1973). 4 SNOWFALL RECORDS SET OR TIED (11/15, 11/12, 11/09, 11/08).